We evaluated the top carpenters framing square available in the market compared the process of tools features, usages, life cycle and cost. In this article, we will talk about the buying factors of framing square, how to use a framing square and few top recommendations for the users along with some basic discussion. Tools Adviser team collaborate with our guest author over here to create this guide for all of you. We research and check many products based on cost, features, using process and so on. Then came up with a list of top recommended product to help you out all. Before buying anything you can read our buying guide to know more and find the suitable one for you. What is a Framing Square Used for? How to Use a Framing Square? How to read a framing square? How to Use A Framing Square to Measure Angles? When doing carpentry work, you would need all the essential tools that will make the task easier and faster. There are different kinds of tools that can be used in DIY carpentry projects such as those that are used for cutting, measuring, and powering through wood and metals. Since you will be dealing with angles, straight cuts, and square measurements, you need to have something that can help you get all these things done. For these purposes, you can make use of a convenient tool that is commonly used by carpenters. If you search for the square framing definition, you will be informed that this tool is also known as a steel square or a carpenter’s square. It is usually made of steel and consists of 2 arms: a short arm and a long arm that meet at a 90 degrees angle. It has ruled edges that can be used to measure up to a certain level of accuracy. In most home stores right now, these tools can be found with a 24-inch blade and a 16-inch tongue. However, there are still some that offer variations. There are small ones that do not come with framing tables. Depending on the projects that you are going to create, you can make use of the model that would be most appropriate. Without this tool, you would not be able to work around the angles and squares that you need for whatever it is that you are constructing. It is one of the most versatile tools that are being used in carpentry right now. There are also a lot of uses which makes it a must-have for almost all carpenters who are planning to build their own business. Your wood frames would surely be perfect when you have this. If you are wondering what a framing square is used for, it has different purposes. 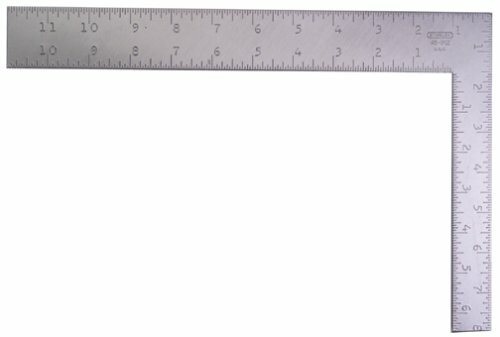 First, it can be used to measure up to 1/32 inch using its ruled edges. Its rafter tables inscribed on its face can also be used to acquire information regarding various roof pitches. Aside from providing measurements and information, it can also be used to cut and make wood frames for the different parts of your house such as the roof. Furthermore, it can also be used to cut stair stringers and for layout purposes. You can quickly establish straight edges and right angles when you have this convenient tool. The instrument is also used to mark your cut lies square and to check for the angles, squares, and stairs that are part of your project. When you have this with you, you can construct any design that you want. It also comes with a framing table that you can use as a platform while creating your project. Not only will you be able to deal with stairs, but you can also extend its use to framing and laying rafters. There have been a lot of innovations when it comes to the use of this instrument so make sure that you know how to handle it. Since its purpose is for making squares, the brand and model that you choose should be able to provide you with this primary function. It should have graduated scales that you can use to measure the frame that you are trying to create precisely. It is much better if the instrument is broken down into fractions of an inch on the top and then in centimeters on the bottom. This way, you can use both systems of measurement. It should be straight and angular enough to achieve the perfect square that you need for your project. It should also be able to perform framing square tricks that would decrease the time that you would need to finish a project. The square should also be lightweight so that it will not be difficult for the user to move the thing around. Also, choose the most durable instrument that can last for years so that you will get your money’s worth. It would be good to get a feel of how to do the squaring before you decide which one to buy. The range is another important factor that you should consider. For more significant projects, you would need a tool that has a greater range so that you can make straight cuts without having to move the frame. Since there are a lot of sizes to choose from, purchase something based on your demand. You will see varying sizes even in online stores so make sure that you check the specifications because it might not work for your project if the size is not appropriate. This is another component that you should prioritize because it will help you gain more control while holding the instrument. Depending on the brand that you are going to buy, you can get brass-plated thumb screws that are more durable than others. These may be used for repeat angle cuts when you are laying out stairs and rafters. You should also check whether they attach well to the squares so that you will have a good foundation. These screws may seem small, but they are an integral part of the tool, serving their purpose well when you know how to use them. You should also check the blade because the functionality of the tool would also depend on this part. Do not buy those that have thin and flexible blades because they would not give you the straight cuts that you need. Also, some manufacturers release those that have rounded over edges which are very hard to manipulate. The gradations might also be difficult to read when you do not have straight blades. The blade can be made from different materials, but many people prefer stainless steel because of its durability. If you are also concerned with aesthetics, you can even match the color of the blade based on the theme of your other instruments. This way, it will be easier for you to classify all your tools. The blade should also have regular gradations because your measurements will be based on this one. This part can be made of wood, and they also differ based on what is available on the store near you. What makes it different from the try square is that it has a movable blade which makes it easier for you to reach greater ranges. You should choose that which is adjustable so that you can create different angles based on your desires and preferences. This can be used with other measuring tools to make sure that it works well with them. The versatility of your instrument largely depends on this one. Before you make your purchase, make sure that you try to slide the angle so that you will get to know whether it will be able to serve the purpose that it is intended for. It might not look like it, but when this part does not work well, everything will fall apart. This is one item that you will surely love because it will add value to your professional skills. This handy tool is very durable. It is made of aluminum, and as such, it is rust proof. You will surely be able to use this for a very long time without having to worry about its quality and appearance. The square has complete scales, ranging from 1/8 to 1/16-inch. It comes with other features such as rafter tables, brace and octagon scales, and an Essex board measure. 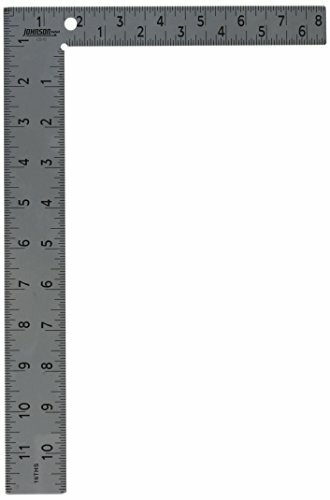 It can be used to measure different lengths and curves because it can be used as a protractor, a saw guide, and a ruler. Like other products of Empire, this one has innovations that you have never seen before. The measurements have high visibility. It is also profoundly stamped, and the gradations will surely last long. The anodized aluminum material that was used for its construction does not rust. It can come in blue or black, depending on your choice. 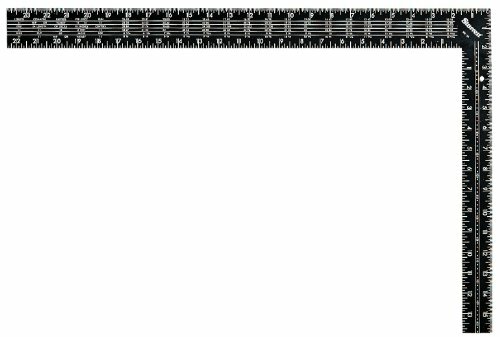 The range also varies from 1/8 to 24 inch so you can use it for different DIY projects. It also makes use of a durable material that will be able to survive scratches and damages. It is worth the price that you are going to pay for it. If you are looking for a premium tool that you can use for your daily construction, then this one is for you. It is very efficient as an accessory to your construction tools. It has a lot of purposes, including straightening the edges of your pieces and determining the flatness of a specific surface. There are a lot of features that you can see in this very handy tool, making it one of the most trusted products that you will handle in your job. It is very user-friendly, and it was designed to cater your ergonomic needs. What you are looking for from a measuring and cutting instrument, you will see in this one. This is probably one of the most durable tools that you will see in Amazon right now. The hardened steel contributes much to its durability, but you do not have to worry because it is still easy to carry. The graduations are embossed so you will be able to read it easily. It can be reversed since the scales can be seen on both sides. It has a protective finish that will surely keep the rust from damaging your instrument. Many people love the efficiency of this tool because of the reverse reading scale feature. This is a good buy. Once you get the hang of it, it will be easy to read the numbers. Worth every cent that you will spend on it. May seem inaccurate at times. This is probably one of the unique tools that you will see regarding its appearance. Looking at it, you might be overwhelmed with the graduations and writings that you will see on the surface. However, as you get used to it, you will see how efficient it is regarding providing you with the measurements that you need. Starrett has managed to come up with a very reliable tool that will surely make things easier for you. One unique feature of this model is the octagonal measuring scale on the front. If you have already chosen your tool, then you should know how to use a framing square properly. Using a framing square does not need complex skills or intensive training. You need to know the basics, and from there, you will already learn the rest. It is a common misconception that only knowledgeable and skilled persons will be able to use the tool. 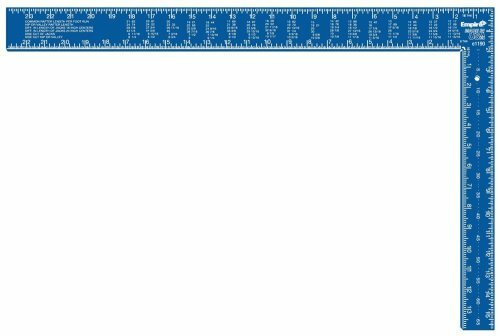 If you think about it, you would just be using a single ruler, except that it has more features and additional purposes as well. Not a lot of people know how to use the instrument so here’s how it is used. The first thing that you need to do is to take note of the graduated scales. It is essential that you know how to read the measurements because the accuracy would depend on how you interpret what is written on the surface of the tool. Different models would show different graduations. Some would be too easy to read while some are not. Choose something which is convenient for your eyes and makes sure that you will not be committing errors when you are reading them. The size of the instrument would also vary and consequently, its range. Depending on the projects that you are going to make, you might need a bigger one that could reach greater lengths. Even though the appearance, writings, or range vary from one brand to another, there would still be a common denominator. Generally, the tool is broken down into fractions of an inch. This can be usually seen on the top part of the instrument. On the other hand, you will see the same measurements at the bottom but this time, in centimeters. This is convenient because you need not convert anymore from one scale to another. You might be comfortable with just one, and it’s alright. To start using the tool, you can begin measuring a cut. All you need to do is to place one of the arms of the angled square parallel against the edge of whatever material it is that you want to cut at a right angle. If you would notice it, the instrument is already shaped at a right angle, so this would not be difficult to do. Just make sure that the edge of the material is straight so that your measurements would also be accurate. Some models would allow you to adjust depending on the range that you need. The next step is to mark a line along the edge of the other arm and mark out a cut line. It is better to have a table for this so that it would be easier to mark the line. The arm that is used for marking will depend on the range of the cut that you are going to make. Choose the longer arm if you would be marking a longer length. Otherwise, use the shorter one. If you think that you already have the perfect markings, then you may now cut along the mark. If you think that there is a bit of inaccuracy in your measurement, then do the same process again. There might be some errors in the placement of the tool itself or on the way that you read the scales. It is essential that you also check out the quality of your instrument because it would also contribute to the idea that you will be using your tool. The purpose of the device will be lost if you do not know how to use it properly. The things that you need are straightforward. Usually, the tool will come with a table and some markers that you can use to make all those lines and cuts. A folding framing square might be more beneficial if you will be using the tool more frequently. This way, you will be able to store the instrument easier and retrieve it with ease also. Make sure also that you use the outside edge of the instrument to avoid confusion. There are different ways by which you can avoid mistakes such as using stair buttons when using the step off method. For large measurements, you can also make use of the two-foot step off technique which is performed by doubling all the sizes on the instrument that you have. This would help in reducing the chances of making errors. As you can see, it is vital that you know how to use your instrument because everything will depend on it. If you will miss a bit of the accuracy, then it would be hard for you to compute for the other angles as well. Try to practice at home using small projects first, and if you are adept already, then you can make more significant projects using the tool. Now that you know how to use one, it is also equally important to understand how to read measurements based on the scales on the surface of the tool. Measuring is as just as important as understanding so make sure that you do this right also. The first thing that you need to do is to place the instrument on the table. Make sure that the skinny length is the one that is pointing to the right. With this perspective, you will be looking at the face of the instrument. If you will review the parts of your tool, the skinny length is called the tongue while the thicker and longer section is known as the blade. It is crucial that you know how to determine these parts because their placement would matter. The heel is the corner of the tool that is made from these two lengths. Your device has two sides. On the face, the tongue would read the eight square scale or the octagonal scale. The blade, on the other hand, would understand the rafter tables. To look at the back side, you need to flip your instrument. There are also some measurements that can be seen on this side. The tongue would read the brace measurements while the blade would learn the Essex board measurements. It is important to memorize these things because the information that you will be getting will depend on this. Some brands would be easier to read than others so make sure that you get these especially if you are just a beginner. Otherwise, you might find it difficult to get accurate measurements. Reading might seem confusing at first because you would have to memorize different sides and look at various writings on the instrument. It would take some getting used to especially if you are not an expert in this kind of things. It requires patience to learn all of these. You also need to know how to use a framing square to measure angles because you will be doing this for every construction project that you are going to make. To be able to do this, you need to place the instrument along the board in a way that it would form a triangle with one end of the tool in contact at the point where you wish your angle to be formed. Measure this distance and write it down as the adjacent length. After which, you need to measure the distance also along the other edge from the corner of the tool to the point where it meets the board. As you can see, a triangle will be formed entirely. This is known as the different length. You would also need to do some math because the opposite length should be divided by the adjacent length. The resulting figure is known as your tangent. Now, you need to look at the tangent table to get the value of the measurement. As previously mentioned, you can also use the tool to cut stair stringers. It is also effortless to perform the steps if you know how to measure based on the parts of the instrument. First, you need to measure the rise and run of the area that your stairs will occupy. Of course, you need to know the number of stairs that would fit in where you are planning to place them. After getting the measurements, divide them by the number of stairs that you want to have. This would depend on the height of the floor. It is crucial that you get the figures for the rise and the run because these will be measured by the tongue and the blade respectively. You need to place the instrument against your 2” by 12” board and then mark the measurements to know where you will be cutting. To make sure that you have accurate measurements, do the same process over again to check what you have previously measured. After which, you can now do the cutting. You need to be careful in doing so because some cuts become curved when the hands are not steady enough or if the instrument is moving a lot. For more multiple purposes, you would need to develop more skills especially in knowing how to layout rafters with just the tool. There would be a lot of measurements that would be required when you are going to do this. To start, you need to know the span of the common rafters or the width of the building where you are going to construct the roof. You also need to see the run and the coverage of the rafter that you are going to create. If you are going to cover just half, you need to divide the whole span into two. Next, you also need to determine the pitch of the roof or its rise. Once you have already done all these, it is time to put your framing square on the top edge of the rafter. Again, the tongue is for the rise while the blade is for the run. Make your markings and then mark the spot where the blade meets the rafter. You need to make certain adjustments such as stepping down the tool to be able to line the tongue on the right spot. Perform all these steps repeatedly until you have no more material. To be able to continue, you need to connect the last dot that you have marked to the edge of the board using the correct angle. Measure this distance and then make the connection from the mark to the last dot that you have made. Make sure that you use a straight edge to preserve the accuracy of your measurements. The next thing that you need to do is to find the birds mouth, and this is done by measuring up to 1/3 of the thickness of the rafter. Measure 1 7/8” from the angled mark and then use the blade and tongue to make your markings again. Now, repeat the process on every angled mark. It might seem a bit confusing, but it is just a repetitive process from the beginning. After doing the layout, you can also learn how to cut rafters with a framing square. As you can see, there are a lot of things that you can do using the instrument. There are times that you must be creative and imaginative to be able to expand the purposes of this tool. Another specialty of this tool angles. Since its primary purpose is to provide squares, it is also best used for angles. You need the perfect angles because the strength and durability of a construction project would depend on its foundation. The foundation, on the other hand, would depend on the angles that were used to build it. If you want to learn how to use a framing square for angles, you would need a scientific calculator to be able to measure the perfect angle using the instrument. For example, if you are planning to make a 65-degree cut on a piece of wood, then you would need to use a trigonometric formula to be able to calculate the length for each line. Next, you need to measure one side of the angle first and mark this line. Next, you need to find the length going from the heel of the right angle to where the triangle will be formed. This will be based on the angle that you want. You would assume that the tongue of the instrument runs along the line that you marked and that the heel outlines the right angle. Afterward, determine the tangent which is the rise equal to the run. Measure this tangent from the top of the square along the blade. Mark this line and the angle that will be formed should be your desired angle. This would seem very complicated, but you will soon get the hang of it through practice. There are a lot of instructional materials that you can read and watch to learn how to do all these properly. When you look at the products in Amazon, you would see that framing square accessories usually come with the tool itself. These accessories contribute to the versatility of the instrument. For example, you can buy a square stair gauge set that you can use for repeat angle cuts for your stairs and rafters. These are usually used for framing and other carpenter squares. These gauges can be made from different materials, depending on the manufacturer. You can also get a cutting map to be able to improve the accuracy of your cuts. This mat will help in ensuring that the measurements that you made will be cut precisely. There are self-healing mats that you can use for a long time. Framing square with rafter tables can also be purchased together with your instrument. Based on reviews, it would be more accessible to layout rafters when you have the table. It would give you the sizes and the measurements that you need to be able to interpret what you are seeing. There are also some marking tools that you can buy. These markers can help in clearly defining the lines that you are going to make. They would write well on the surface of your tool so you would be able to see them. You can also get accessories that can help in letting you know how to use a framing square to cut rafters. Many cutting tools are compatible with your instrument. Simple cutters will do if you are only going to cut plywood. However, for more durable materials, you would need huge cutters. These accessories are usually cheap because they were meant to be purchased even by those who are not into businesses. Make sure to watch out for packages that would include all these accessories. There are a lot of deals and discounts out there also that you can avail of. Before you go online, you already must know what you want so that you would not take too much time choosing among these accessories. Some people get confused when they hear the term carpenters framing square. This is because you might think that it is different from a framing square. In actuality, the latter is used to describe the general term of a tool that is used for squaring. There are a lot of different types of this tool such as your combination square that is good for marking lines at 90, 45, and 135-degrees angle. It also has an adjustable ruler that you can use for measuring depths and holes. Another type is the Stanley Speed Square that is very handy when it comes to making rafters. It is the perfect thing to use when you are planning to make circular cuts on your foundation materials. There is also the tri-square that you can purchase if you will not need an adjustable rule. Lastly, the carpenter square is another type. This tool can be used for a variety of purposes including lay outing rafters, cutting them, making measurements on certain surfaces, and a whole lot more. It can also be used for other industries that would need construction projects. What makes it different from the rest is its very simple design and its functionality. It might seem like a simple tool, but it is an essential one. Carpenter square vs. framing square should not exist because they are not comparable. The latter is more general than the former, and this is something that should be known by people. This misconception can produce errors such as in purchasing the product itself. Thus, a craftsman framing square, as it is also known, was designed to perform the duties of a carpenter in the industry where he or she belongs. The next time that you go to your local home store make sure that you learn how to differentiate among the different types so that you will not be confused as to what you are going to buy. Hey Daron here, owner of the Tools Adviser and a woodworker by passion. This guide is to help you out to find the best tool for your woodworking project. Do you know how to use a framing square? Choosing the best one is a confusing task. Read our buying guide and tricks to get the right one.